The galvanised steel single door floor standing enclosure range, MCSE, is available off the shelf in different sizes. It is designed to meet EMC requirements. An excellent Faraday effect is created, since electrical conductivity between the enclosure body an door is guaranteed. The risk for component failure, and with that unnecessary downtime, is eliminated as electromagnetic interference is avoided and water and dust are prevented from entering the enclosure. 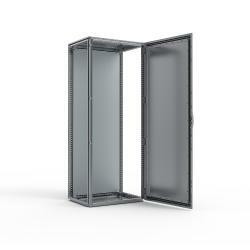 This enclosure range is well suited for applications where EMC is required. Frame: 1.5 mm / 1.75 mm zinc plated steel. Door: 2 mm zinc plated steel. Rear, roof and side panels: 1.5 mm zinc plated steel. Mounting plate: 3 mm galvanized steel. Bottom plates: 1 mm galvanized steel. With 4 hinges allowing left or right hand opening. Including door frame with 25 mm hole pattern. Sealing is attained by a conductive polyurethane EMC gasket. Espagnolette 4-point locking system. Does not interfere with the enclosure inner space. Standard double-bit lock with 3 mm pin. Standard inserts, cylinders, lift handles and T-handes are available as accessories. Double folded and slides into position. Adjustable in depth by steps of 25 mm, with the MPD02 accessory. In the enclosure delivery, mounting plate is supplied, attached on the outside of the enclosure packaging. Consists of three pieces. For 800 mm deep 4 pieces. RAL 7035 structure powder coating on the outside only. Frame with fitted door, rear panel, roof panel, bottom plates, mounting plate and door frame. Delivery also includes earthing bolts and EMI conductive combination gasket. Delivered on a pallet which is identical to the width of the enclosure to allow baying without removal. All packing material is recyclable. Also available in stainless steel (MCSSE).